NGC 4725 is a barred spiral galaxy of more than 100 thousand light-years across, located about 41 million light-years away from Earth in the northern constellation of Coma Berenices (Berenice’s Hair), while it is receding from us at approximately 1206 kilometers per second. 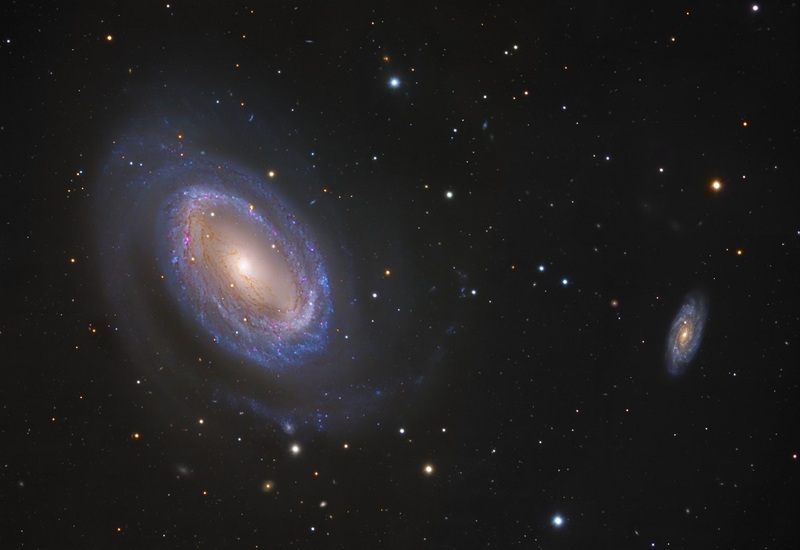 It is the dominant member of the Coma II Subgroup or the NGC 4725 Group (within the larger Coma-Sculptor Group), a small group of galaxies that also includes NGC 4712 (the spiral galaxy on the right side in this image), NGC 4747, both at a distance of approximately 200 million light-years and PGC 86434, at a distance of approximately 50 million light-years. The generally accepted cause for the severe distortion of the smaller NGC 4747, and three tidal tails, is tidal interaction with the massive NGC 4725. This peculiar galaxy has just one spiral arm, unlike most other galaxies, including our own Milky Way, who have two or more spiral arms. This single arm is tightly wound around the core, and is made up of dust and gas illuminated by newborn stars, many bright blue star clusters and pinkish HII regions where new stars are forming, which are seen more where the arm connects to the central bar. In the center is a population of older yellow stars. A prominent ring of stars encircles the bar of stars at its center, what places NGC 4725 in a distinct subgroup of galaxies called “Ringed galaxies”. It is also classified as a “Seyfert Galaxy”, suggesting an active galactic nucleus containing a supermassive black hole. Three supernovae have been observed in this galaxy: SN 1940B, a Type II-P supernova discovered on May 4, 1940, with a maximum brightness of 12.80; SN 1969H, a Type I supernova discovered on June 17, 1969, with a maximum brightness of 15.00 and SN 1999gs, a supernova (Type unknown) discovered on Dec. 28, 1999, with a maximum brightness of 19.30. A supernova is a phenomenon in which a star explodes in the final phase of its life. There are two types: Type I and Type II. The Type I does not show hydrogen in the spectra. The other group, Type II, are explosions of massive stars (initially more than 8 times the mass of the Sun), which do show hydrogen in their spectra. This is a composite image from multiple data sources: the 8.2 Meter Subaru Telescope (NAOJ) and the Hubble Space Telescope, and obtained from the Hubble Legacy Archive, which is a collaboration between the Space Telescope Science Institute (STScI/NASA), the Space Telescope European Coordinating Facility (ST-ECF/ESA) and the Canadian Astronomy Data Centre (CADC/NRC/CSA).